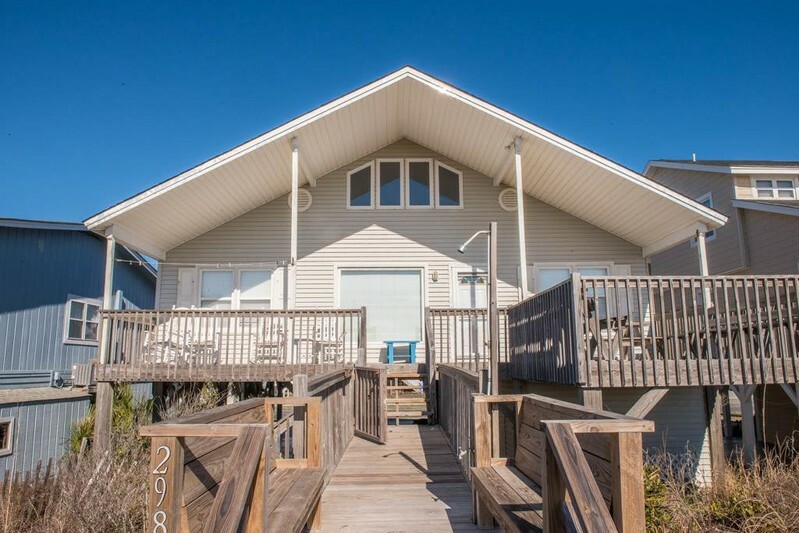 Open and airy beach cottage that has updated decor for a perfect family retreat. Private walkway and stupendous views of the Atlantic Ocean. Covered and uncovered porches, plenty of seating to take in the ocean breezes, watch the dolphins and enjoy the sunset. Enclosed outside shower with hot water, spacious sundeck with porch furniture. This cottage accommodates 18 comfortably in 5 Bedrooms and 3 full size bathrooms. On the first floor there are four bedrooms split by a large open concept kitchen and living area. Four bedrooms flank either side of the main living space with a shared jack and jill bathroom for each side. Upstairs in an enclosed loft, enjoy a fifth bedroom with ensuite shower. Large flat panel television in the main living space, DVD player, expanded cable service, wireless internet access, dishwasher, washer/dryer, microwave, and outside shower. Non-smoking, no pets. Bedding: Down- Queen/Queen, Queen/Queen, Queen/Queen, Queen, Q Sleep Sofa, UP- King.